Be convinced and impressed about the power of New MRP. 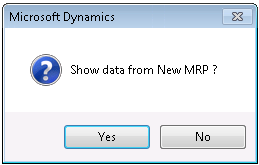 Test the module in your current installation as a “try out” before purchasing a full New MRP License. New MRP module has been designed as a genuine add-on module that does not make changes to the existing old Master scheduling or alter surrounding functionality. This means that both old MRP and New MRP can calculate demands coming from productions, forecast, purchases and sales orders at the same time. Contact New MRP Solutions to get started with your try out installation or get an attractive offer which includes both try out installation and education. This makes it incredibly easy to compare the results from New MRP with the results from Old MRP. It also makes the shift to New MRP very safe. As long as you want, you can continuously run and update both Old MRP and New MRP and it is continuously possible to change the primarily used Master scheduling. Write to info@newmrp.com for getting a try out version on attractive conditions, which includes both installation and education.